My boots aren't made for walking. That was unfortunate yesterday. After a nice lunch at Au Bureau (The Office) in Orléans, I said a hasty goodbye to my friend and grabbed a perfectly-timed tram (your chariot awaits, madame) to head back toward La Ferté. 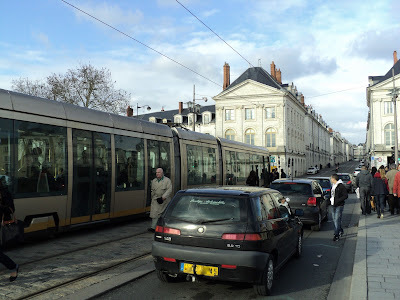 But moments later as we crossed the George V Bridge over the Loire River, the tram slowed to a stop and shut off. A problème, announced the conductor. Minutes later he strolled to the back and unlocked the doors. We were being released for "safety reasons." Our safety, or his from angry passengers? He said he had no information except that there was a system-wide electrical issue and he had no idea when it'd be fixed. I quickly visualized how far it'd be to walk to my car, two towns away. After all, I had to get the kids, come electrical tram woes or high water. It's nice to be from a small town at moments like this. Another former soccer mom from La Ferté then approached me and asked where I'd parked. I was at the further of two stations and Claire was at the closer one, which was already far enough. Exactly 3.7 long kilometers in ill-fitting boots, so I know now. We briskly walked and chatted through neighborhoods I'd often wanted to see up close and personal. (See Église Saint Marceau.) Just not like this -- I had people to see and places to go before picking up A&E from school. As we finally reached our station nearly an hour later, bien sûr--of course--the trams started rolling again. First, two in the opposite direction, then one in ours. Claire still drove me to my car in case no others came, and I was finally on my merry way... blisters and all. Okay, so it wasn't such a traumatic experience, but I learned an important lesson: it's time to buy new boots that are comfy for long distances. And soon--while it's still the Soldes, the sales period. However, the best stores are in the city... So, I'll have to take the tram.